This film ranked #18 in Time Out's list of the 100 greatest French films. Click here to see the full list. 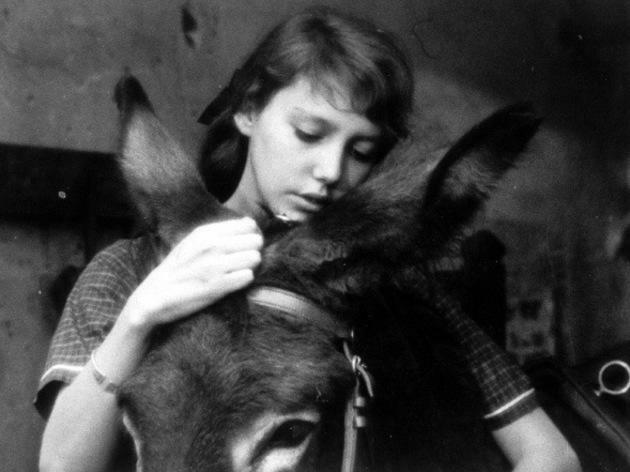 Animal as saint: Bresson's stark, enigmatic parable, a donkey (named after one of the Three Wise Men) is both a witness to and the victim of mankind's cruelty, stupidity - and love. 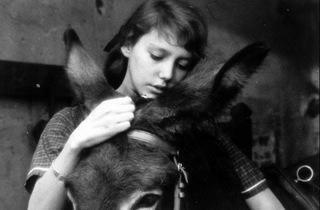 Taking his lack of faith in theatrical acting to its logical limit, Bresson perversely places the mute beast centre-screen as he passes from owner to owner, giving rides, heaving agricultural machinery, and receiving beatings and caresses in a coolly observed landscape of poverty and folly. The effect could not be more different from that of other films (Disney's say, or Jaws) that centre around animals; Balthazar's death during a smuggling expedition, amidst a field of sheep, is both lyrical and entirely devoid of maudlin sentiment. Imbued with a dry, ironic sense of humour, the film is perhaps the director's most perfectly realised, and certainly his most moving.